Fast and efficient, your music will be in stores worldwide within hours of approval. No upfront fees, Maintain 100% control. ONErpm’s intuitive dashboard and suite of business tools give creators total control over the distribution workflow, while making it easy to collect royalty payments, process reports, pay other rights holders, monitor daily and monthly performance of your content, and integrate your marketing with social media. For download services, you can specify the price. Keep your audio secret until the day of the release. Deliver a combination of audio and video tracks in an album. No manual entry needed. Deliver your entire catalog metadata via xls/txt/ .csv bulk uploads and audio files via FTP. Codes are assigned to each track as needed. Split revenues with collaborator/owner on any track, video, album, or ringtone. ONErpm also supports royalty sharing across entire accounts encompassing the entire body of work. Get a daily snapshot of how your content is performing. Adjust marketing strategies in real time as needed. Are you a quant nerd? These stats are for you! Do a deep dive of your content’s performance, whether by track, video, artist, territory, and more, for a specific date range. Conduct historical analyses and head-to-head comparisons with easy-to-use graphical charts. Know when your songs are featured in a Spotify, Apple, or Deezer playlist. Know when your songs or videos are being used on user generated content (UGC) YouTube videos. ONErpm serves up a suite of embeddable Player Widgets that link directly to your release on the platforms of your choice, and serve up click tracking data to go with! Easily share your content with correct links to all platforms. Easily compile your marketing drivers into an easy-to-read one sheet that links to our pitch forms. Use our pitch form to more effectively communicate pertinent information about your release to Spotify, Apple, and other platforms. Receive dashboard notifications of important website updates and of your release(s). ONErpm’s multi-lingual agents are available to resolve most issues within 24 hours. See our FAQ first. Qualifying accounts will be assigned a dedicated account manager. When you link your social profiles to your ONErpm account, we will be able to better measure your true audience reach and correlate how social marketing impacts each of your releases. ONErpm’s in house social media advertising agency can help properly boost posts and run targeted ad campaigns. Our experts can help you verify your Instagram, Facebook, YouTube, and Spotify profiles. 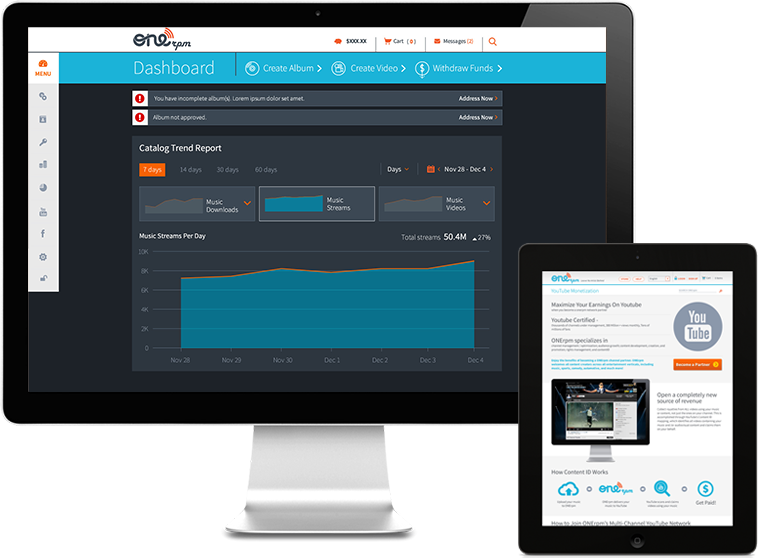 The ONErpm platform makes it easy to share your release on most social media platforms directly from your dashboard. Boost your email marketing audience with this simple, true and tried tactic. Create and manage a custom store on Facebook for each of your artists and / or for your entire catalog. Downloadable guides for Spotify, Apple, YouTube, and others. Everything you need to know in order to best manage your account. Good examples of what to do, and what NOT to do.